REAL ESTATE OFFERED AT 3PM.- Call Now for private showing. This 4BR Vinyl sided Cape Home is in beautiful condition. Nice open kitchen with seperate dining room. Full dry useable basement with wood furnace back up. 3-Car detached garage. Great Country Setting. 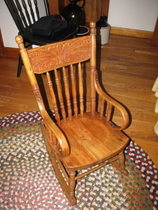 Click on Real Estate Tab for more information, photos, terms, etc..
Auction: April 14th @ 10am. Location: Rt. 848 in New Milford Township. Take I-81 to Exit 223, New Milford, turn Left onto Rt. 492, go 1 mile to stop sign (Rt. 11), turn Left, go 100 feet, then turn Left again onto Rt. 848. Go 1 1/2 miles to Auction on Left. (Rt. 848 also known as the Harford to New Milford Rd). REAL ESTATE OFFERED AT 3pm. Please call 570-430-2222 for a private showing. Click on the Real Estate Tab to the Left for more photos and information, terms, etc.. This 4 bedroom home is in mint condition with beautiful wood flooring. Full Basement, 3-car garage. Excellent location and setting just outside of New Milford and only a couply miles to I-81. 4 Bedroom Home, Full Basement with workshop. 3 car garage. Beautiful Setting and in Mint Condition. Be sure and click on the Real Estate Tab to the Left for more photos and information on this Real Estate Offering. Motivated Seller..... Call Now for Appointment. 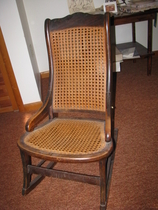 Quality Antique Auction- April 14th @ 10am. New Milford Township Located on Rt. 848 just a couple miles off I-81. We are unable to post all the photos however if you email me, I'd gladly send you more photos. Mark your calander NOW! This one sale you don't want to miss. Many crocks, glassware and hard to find items. This Saloon Table may be a one-of-a-kind! Come early on April 14th to get your bid number. For more information, please email us. Very Early Canopy Bed. (Full size) You will find the details outstanding. Absolutely Beautiful. Many unusual and unique treasures you will find at this auction. Come early to get your bid number.. See you on April 14th... Sale starts promptly at 10am. So you've always wanted an Antique Secretary? This one will look outstanding in any room. 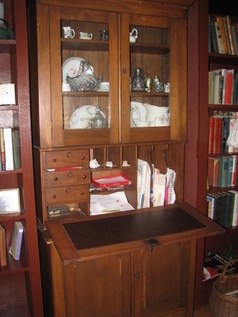 Notice the leather on the writting desk as well as the extra pigeon holes, drawers, lower storage and glass display. Be ready when we Auction this real beautiful piece of history. This Electric Fireplace plugs into any wall outlet. It not only looks warm but features two settings. One for looks and one if you need to warm up the room a little. 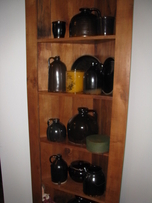 These Jugs, Amish Plates and the Corner Shelf will be sold on April 14th...... Sale starts at 10am sharp but come early to get your bid number. Don't Worry... There is more than one of these beautiful night stands. I'm sure you have just the perfect spot for the set of these. 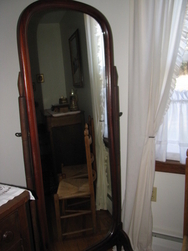 Take a Closer Look at what is being offered at the sale in this photo. All items on the table, The Table itself, 4 handbent farm chairs, the hutch in the backround and everything in it and on it, even the Rug under the table.. So Look again ! TOOLS STARTING AT 10AM. If you're looking for just about any kind of hand tool, wood clamps (large, very large, and small), screwdriver sets, saws all, hardware & organizer, etc... Mark April 14th on your calander. We have (2) Band Saws to offer at this auction, so get your bid number early and pick out one or both for your shop!. Craftsman 8" - 3 speed Drill Press, Drill Bits, Irwin Auger Bits, 6" heavy duty Bench Grinder, Metal Shelving, 1 1/2 hsp. Bostitch Air Compressor, Router Table, 48" Farm jack, Wheelbarrel, Tow Chains, Walk behind spreader/seeder, and much more. Cub-Cadet LT 1042 Hydrostatic Drive with 42" mower, wheel weights, chains. Also a 42" snowblade, Pull behind lawn cart, 20" push mower, Cub Cadet 528 Snowblower with Elect. Start. Shop Smith Combination Lathe, Saw, etc.. Bring your pick-up trucks and trailers. Lots of Shop and Woodworking Tools, etc..
Metal Shelving and loads of hardware, saw blades, woodworking tools and a whole lot more ! Come early to get your bid number... Sale starts promptly at 10am. THIS IS ONLY A PARTIAL LISTING, We are finding more things daily. Take a Good Long Look at all these tools! Notice the table full of Antique Tools as well as all the power tools, Saw blades, Nut & Bolt organizers, and even the shelving will be sold! Cub Cadet 528 Snow Blower with Electric Start. Looks and Runs like New. We just pluged it in, hit the start and you're up and running. Multi speed forward and reverse. A real sharp blower. Just the right size AIR COMPRESSOR. Large enough to do the job yet small enough to take anywhere. Fiberglass Toner Cover: Just came off a Toyota Tocoma. Clamps included. Upright Freezer, Without being a monster size, this one is just the right size. Terms & Conditions of Sale: Everyone must have a number to bid. Cash or Good Check with Pa Drivers License. All items must be paid for and removed day of auction. All terms and conditions announced day of sale take presidence.